A Rice University-led team of U.S., German and Chinese physicists cites first evidence of a link between magnetic properties and the tendency of barium iron nickel arsenide to become a better conductor of electricity in some directions than in others. 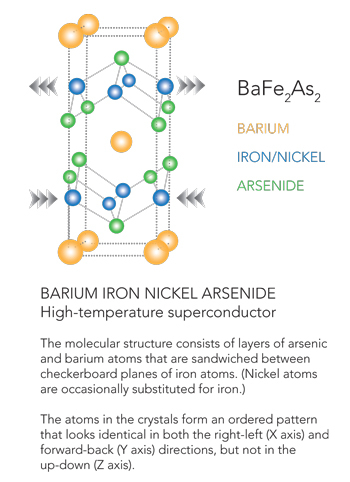 There are now new clues about one of the baffling electronic properties of the iron-based high-temperature superconductor barium iron nickel arsenide, according to a Rice University-led team of U.S., German and Chinese physicists that has discovered, based on sophisticated neutron measurements, of a link between magnetic properties and the material’s tendency, at sufficiently low temperatures, to become a better conductor of electricity in some directions than in others. The odd behavior, which has been documented in a number of materials, occurs at temperatures slightly higher than those needed to bring about magnetism; magnetism is believed to be essential for the origin of high-temperature superconductivity. The scientists – from Rice, the Chinese Academy of Sciences in Beijing and Germany’s Technische Universität München (TUM) – said the first evidence includes the discovery that the directionally dependent behavior arises from inherent physical properties of the material rather than from extraneous impurities, as had been previously suggested. These findings are based on inelastic neutron-scattering experiments performed on samples of barium iron nickel arsenide at the PUMA triple axis spectrometer at TUM’s Heinz Maier-Leibnitz Zentrum in Garching, Germany. The research team is hopeful the findings will prove useful in explaining the underlying physics of directionally-dependent electronic phenomena that have been observed in several different types of superconducting materials. “Most high-temperature superconductors, and many closely related compounds, exhibit a number of exotic electronic phases, particularly as they approach the critical temperature where superconductivity arises. Inelastic neutron scattering and other techniques are now allowing us to explore the physical basis of many of these phases,” said Pengcheng Dai, professor of physics and astronomy at Rice. The magnetic behavior observed by the inelastic neutron-scattering measurements reflects the way the spins of the electrons are dynamically organized in the material. 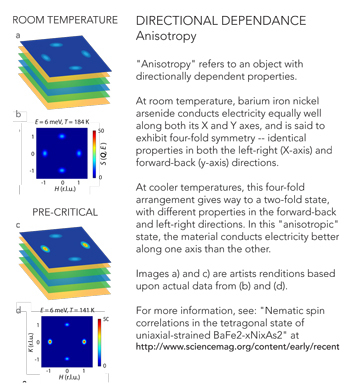 Further, this spin excitation anisotropy sheds new light on the microscopic origins of electronic phases in the iron pnictide superconductors and may help explain the interplay between magnetism and superconductivity and, more generally, the mechanism for superconductivity, in the iron pnictide superconductors.